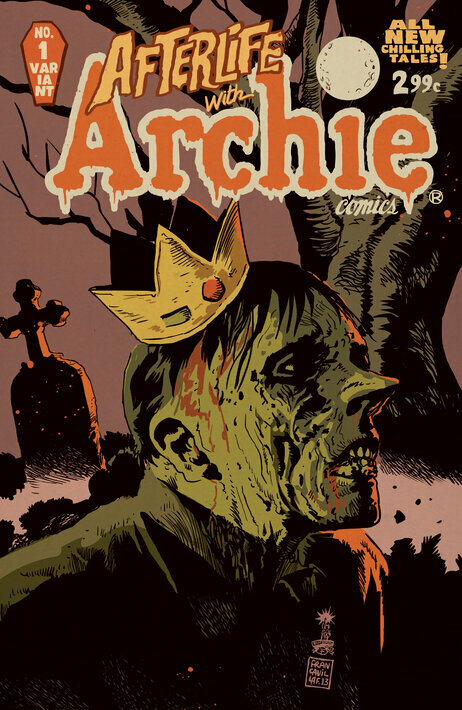 Scooby and Archie are both taken to some pretty dark places -- the first is a totally imaginary scenario (in a novel that also gives you Homes Simpson in a noir called D.O.H. ), the second an actual thing you can pick up. Thomas Pynchon's Bleeding Edge provides an imaginary Scooby Doo set-up that actually sounds just a smidgen less dark than what the Archie folks are going to do to Archie in a five-issue run. "Hi, mom." She wants to enfold him forever. Instead lets him recap the plot for her. Shaggy, somehow allowed to drive the van, has become confused and made some navigational errors, landing the adventurous quintet eventually in Medellín, Colombia, home at the time to a notorious cocaine cartel, where they stumble onto a scheme by a rogue DEA agent to gain control of the cartel by pretending to be the ghost -- what else -- of an assassinated drug kingpin. With the help of a pack of local street urchins, however, Scooby and his pals foil the plan. The cartoon comes back on, the villain is brought to justice. "And I would've gotten away with it, too," he complains, "if it hadn't been for those Medellín kids!"